Anyone passing Symn Lane over the Christmas holidays might have been surprised to see people walking around up high behind the fire station. 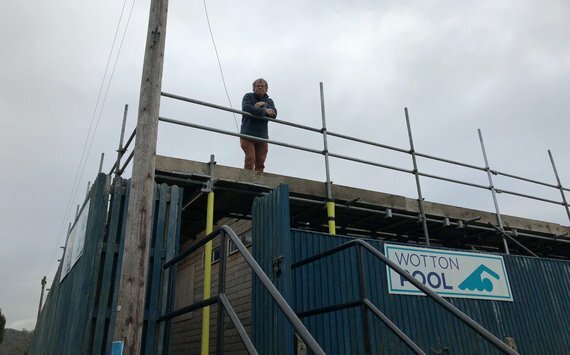 Well don’t worry, it’s not ASBO kids, we’ve been working hard in the cold rigging up a state of the art solar heating system for the water in Wotton Pool. Last winter was also pretty productive. A team of festivity-fatigued volunteers replaced the cladding around the old changing room building, which was originally built in the 60s! More about last year’s work here. Over the last few weeks, we’ve begun installation of WSP’s latest solar innovation. Swimming pools lend themselves nicely to (thermal) solar heating, as they tend to work well when there can be a lot of warm water. (Traditional use cases call for a smaller amount of really hot water! Or electricity). The new panel won’t be as efficient as something Elon Musk would put on a roof. But for a low cost, low maintenance installation, the energy is there to be had. So lets have it! Wotton Pool has always been a hotbed of technological innovation. 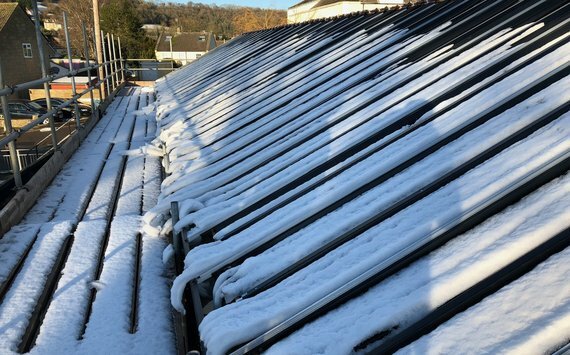 Its first thermal solar panel (V1) was built in the 70s! Like most things from the 70s, the time came when it had to be replaced. For a few years an updated less-homebrewed solar panel brought about 6kW of heat into the water. But we can do better. 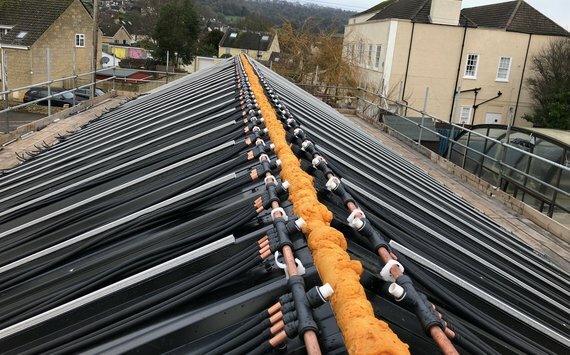 Over 2km of rubber pipe on the roof! The solar system we’ve been running for the last few years (V2) logs data to this website, so anyone can take a look at how much energy is coming in. You can take a look now, but bear in mind it might not be doing anything if you’re reading this at night or in winter. 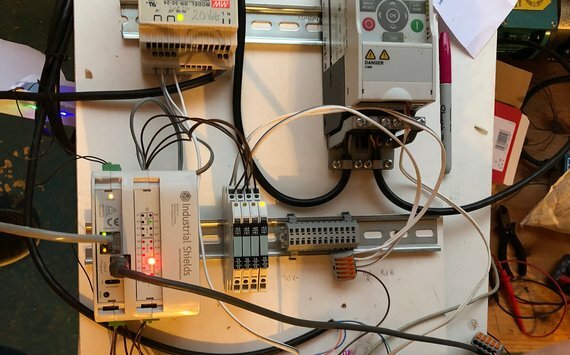 The V3 panel will of course be online like any self-respecting industrial installation, and the control system is coming along nicely. Stay tuned for more updates! The 2018 season starts on 14th of April.